The four stugs are assembled and one of the Panzer IIIN. I finished all of this before the weekend. 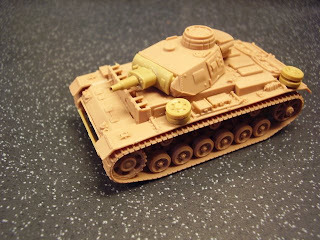 The lower hulls of the stugs I have started painting already, I will finish all the lower hulls before I attach the skirt armour. adding zimmeritt to a die cast P anther and modifying some 20mm metal figs. Zermmit? I bet that can get very messy! 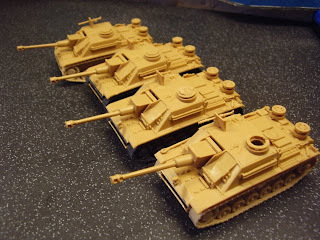 Stugs are looking good! 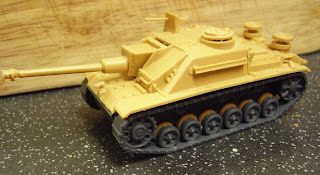 I only have the glacis plate left to do with the Zimmerit...I tried to take a photo last night but it was crap. 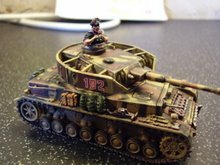 More photos soon of the stugs. Doing 4 projects at the same time moving from one to another. Did you sort out your transport problem for Hastings? What's up? Nothing since April. Has real life got in the way? Looking good James - who makes them mate?